Uveal melanoma represents ∼85% of all ocular melanomas and up to 50% of patients develop metastatic disease. Metastases are most frequently localised to the liver and, as few patients are candidates for potentially curative surgery, this is associated with a poor prognosis. There is currently little published evidence for the optimal management and treatment of metastatic uveal melanoma and the lack of effective therapies in this setting has led to the widespread use of systemic treatments for patients with cutaneous melanoma. 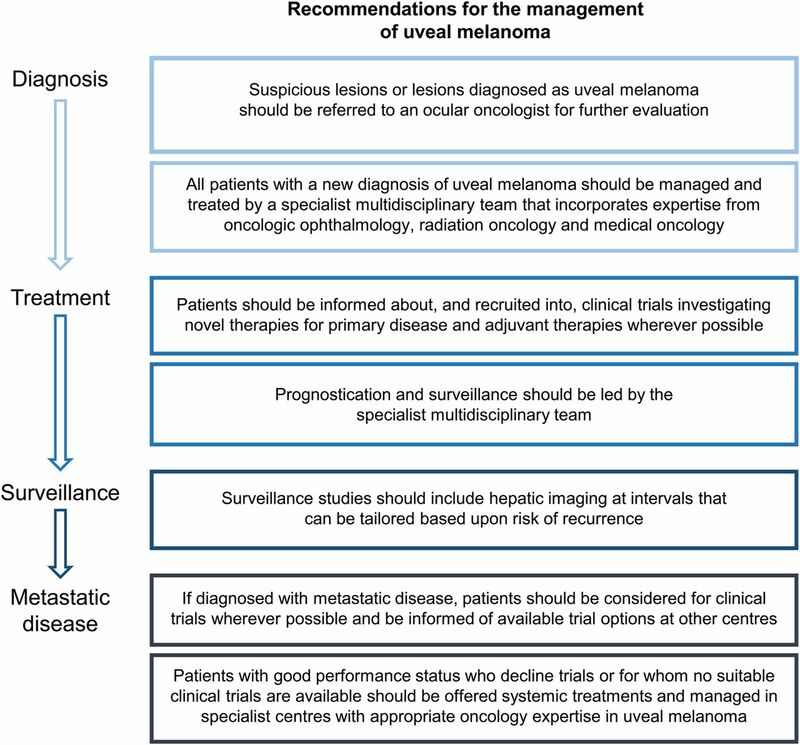 Uveal and cutaneous melanomas are intrinsically different diseases and so dedicated management strategies and therapies for uveal melanoma are much needed. This review explores the biology of uveal melanoma and how this relates to ongoing trials of targeted therapies in the metastatic disease setting. In addition, we consider the options to optimise patient management and care. Representation showing the mutations associated with the RAS/RAF/MEK/ERK pathway observed in melanoma.94–101 (Adapted from Vidwans et al102). GPCR, G-protein coupled receptor; RTK, receptor tyrosine kinase. The molecular profile of uveal melanoma is different from those of cutaneous or mucosal melanomas and is composed of a number of chromosomal abnormalities and somatic gene alterations (figure 1). 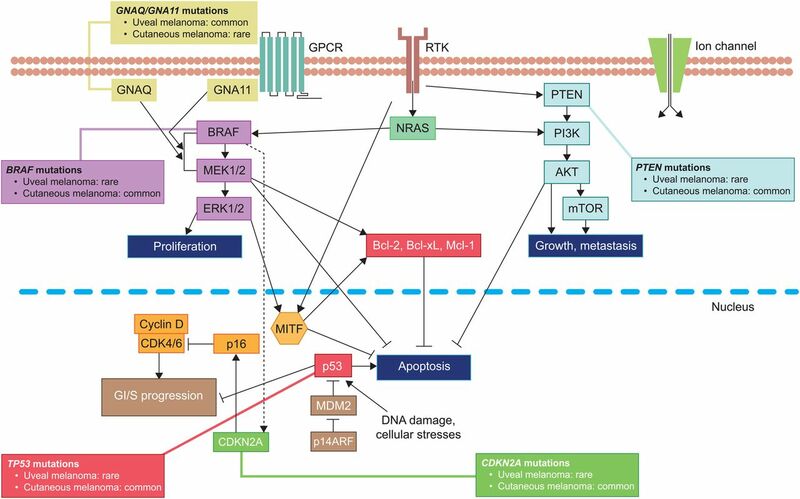 Oncogenic mutations in genes associated with the G-protein-α subunits GNAQ or GNA11 are observed in ≥80% of primary uveal melanomas and are associated with constitutive activation of signalling pathways including the central oncogenic RAS/RAF/MEK/ERK (RAS-ERK) pathway;18–20 thereby driving cell proliferation, tumour growth and progression21 ,22 (figure 1). Nivolumab and pembrolizumab, fully human monoclonal antibodies targeting the programmed cell death 1 (PD-1) receptor are approved in the USA and Europe for advanced melanoma.53–55 However, the activity of PD-1 inhibition in uveal melanoma has not yet been well described. Initial assessment of pembrolizumab in seven patients with metastatic uveal melanoma who had progressed on ipilimumab reported a median PFS of ∼3 months;56 a phase II trial in patients with metastatic uveal melanoma is currently recruiting (NCT02359851). There is a real need for specifically approved treatments and dedicated management strategies in order to improve outcomes for patients affected by this difficult-to-manage disease. Given the limited activity of currently approved agents for advanced melanoma in the treatment of metastatic uveal melanoma, efforts have been placed on conducting clinical trials that have been designed based on our increased understanding of the biology of this disease. GNAQ/GNA11 mutations drive the constitutive activation of the RAS-ERK pathway. However, uveal melanomas lack the oncogenic aberrations of this pathway such as BRAF,57 which mediate sensitivity to the BRAF inhibitors vemurafenib and dabrafenib in cutaneous melanoma.58 ,59 Given the molecular profile of uveal melanoma, there is a rationale for treatments that target downstream components of the molecular pathways driving tumour growth, including MEK and protein kinase C (PKC). Based on these promising observations, a phase III trial (n=129) to assess the efficacy of selumetinib in combination with dacarbazine in patients with systemic treatment-naïve metastatic uveal melanoma was initiated (SUMIT, NCT01974752).64 This was the first clinical trial in uveal melanoma designed with intent to register a drug product with regulatory bodies. However, SUMIT did not meet its primary end point of PFS by blinded independent central review (BICR).65 Median PFS was not significantly improved in the selumetinib+dacarbazine arm compared with the placebo+dacarbazine arm (2.8 vs 1.8 months; HR 0.78 (95% CI 0.48 to 1.27); two-sided p=0.32); the corresponding response rates were 3.1% and 0%, respectively (two-sided p=0.36). There was a numerical improvement in investigator-determined median PFS in the selumetinib+dacarbazine arm (3.8 vs 2.1 months; HR 0.49 (95% CI 0.28 to 0.84)). Further evaluation of the discrepancies between BICR and investigator-determined PFS and assessment of biomarkers are ongoing. OS data were immature at the time of primary analysis and no further analyses are foreseen based on trial assumptions. Differences in patient population, study design and notably the addition of dacarbazine to selumetinib in SUMIT, compared with selumetinib monotherapy in the phase II trial43 may have led to the differences observed in PFS between the two trials. Further assessment of selumetinib for the treatment of uveal melanoma is ongoing in a trial comparing weekly intravenous paclitaxel 80 mg/m2 in combination with selumetinib 75 mg and weekly intravenous paclitaxel 80 mg/m2 in combination with selumetinib 75 mg twice daily with 2 days off prior to each paclitaxel bolus (EudraCT: 2014-004437-22). A second phase I trial is being developed in which selumetinib will be escalated above 75 mg twice daily using an intermittent dosing schedule of 3 days on followed by 4 days off. Phosphorylated AKT is observed in >50% of uveal melanomas and is associated with a higher risk of metastatic disease.68 A phase II trial prospectively evaluating the efficacy of trametinib with or without the AKT inhibitor GSK2141795 in patients with metastatic uveal melanoma is ongoing (NCT01979523; table 1). As selumetinib in combination with the AKT inhibitor MK2206 reduced cell viability by >50% in multiple GNAQ-mutant uveal melanoma cell lines and reduced tumour volume in mouse xenograft models,69 the combination of MEK and AKT inhibition is a treatment strategy of interest. Activating somatic mutations in GNAQ led to the constitutive activation of the downstream PKC pathway PLCβ/PKC/ERK1/2.70 Preclinical in vitro models showed a strong sensitivity to synergistic treatment with the MEK inhibitor binimetinib (MEK162) and the PKC inhibitor AEB071 (sotrastaurin), associated with halting of proliferation and induction of apoptosis. The combination also significantly reduced tumour size in a GNAQ-mutant mouse xenograft model.71 The combination of binimetinib and AEB071 is being investigated in a phase Ib/II trial in patients with metastatic uveal melanoma (NCT01801358). Activating mutations of GNAQ and GNA11 upregulate the hepatocyte growth factor, MET, which is implicated in the metastasis of uveal melanoma.78 Clinical activity in patients with uveal melanoma has been achieved with cabozantinib, a non-selective dual MET and VEGF inhibitor.79 Subset analysis of 23 patients with uveal melanoma treated as part of a phase II trial revealed a median PFS and OS of 4.8 and 12.6 months, respectively.78 On the basis of these encouraging data, a uveal melanoma-specific phase II trial comparing cabozantinib with temozolomide has been initiated (NCT01835145). Adoptive T-cell therapy has shown promise in the treatment of metastatic solid cancers and activity in a uveal melanoma preclinical mouse model.81 ,82 A phase II study (NCT01814046) is investigating the use of chemotherapy followed by autologous tumour-infiltrating lymphocytes with or without high doses of the growth factor interleukin-2 in patients with metastatic ocular melanoma. Localised radioembolisation using yttrium-90 (90Y)-labelled microspheres has also shown benefit for patients with liver metastases. In a small trial of 13 patients, partial responses and stable disease were observed in eight and two patients, respectively.91 The combination of 90Y-labelled microspheres with sorafenib is being studied in a phase I trial (NCT01893099) and combination with ipilimumab is being assessed in a phase 0 study (NCT01730157). The UK guidelines emphasise the importance of consulting the patient at all stages of their treatment, ensuring individuals are fully informed of any risks, benefits and quality of life implications throughout their treatment and post-treatment surveillance.40 ,93 They recommend that this consultation process should be coordinated by a multidisciplinary team with experience in uveal melanoma treatment, made up of a medical or clinical oncologist, an interventional radiologist, a histopathologist, a liver surgeon and a clinical nurse.40 (figure 2). Uveal melanoma is considered rare, but is in fact the most common primary intraocular malignancy in adults. Biologically distinct from cutaneous melanoma, there are a number of underlying somatic gene alterations in uveal melanoma associated with a variable prognosis, which are currently being targeted in clinical drug development. Metastatic disease is associated with a poor prognosis and as such the early identification of patients at high risk of metastases by genetic analysis may allow for personalised management and surveillance. As our understanding of the biology and treatment of this disease develops, multidisciplinary team care will be central to patient management to help optimise outcomes. The authors thank Jon Moran, PhD, from iMed Comms, who provided medical writing support funded by AstraZeneca.
. The National Cancer Data Base report on cutaneous and noncutaneous melanoma: a summary of 84,836 cases from the past decade. The American College of Surgeons Commission on Cancer and the American Cancer Society. Cancer 1998;83:1664–78.
. Dysplastic nevi are a risk factor for uveal melanoma. Eur J Ophthalmol 1996;6:472–4.
. Progress in the management of patients with uveal melanoma. The 2012 Ashton Lecture. Eye (Lond) 2012;26:1157–72. Collaborative Ocular Melanoma Study Group. The COMS randomized trial of iodine 125 brachytherapy for choroidal melanoma: V. Twelve-year mortality rates and prognostic factors: COMS report No. 28. Arch Ophthalmol 2006;124:1684–93.
. Assessment of overall survival from time of metastastasis in mucosal, uveal, and cutaneous melanoma. J Clin Oncol 2014;32(Suppl):Abstract 9074.
. PRAME as a biomarker for a new molecular subclass of uveal melanoma. Cancer Res 2015;75:4262.
. Sunitinib versus dacarbazine as first-line treatment in patients with metastatic uveal melanoma. J Clin Oncol 2013;31(Suppl):Abstract 9031.
. Long-term survival benefit from ipilimumab treatment in metastatic uveal melanoma patients. J Clin Oncol 2014;32(Suppl):Abstract 3060.
. Ipilimumab in the treatment of uveal melanoma: the Memorial Sloan-Kettering Cancer Center experience. J Clin Oncol 2012;30(Suppl):Abstract 8549.
. Phase II study evaluating ipilimumab as a single agent in the first-line treatment of adult patients (Pts) with metastatic uveal melanoma (MUM): the GEM-1 trial. J Clin Oncol 2014;32(Suppl):Abstract 9033.
. The use of pembrolizumab for the treatment of metastatic uveal melanoma. J Clin Oncol 2015;33(Suppl):Abstract 9010.
. Absence of BRAF and NRAS mutations in uveal melanoma. Cancer Res 2003;63:5761–6.
. SUMIT: Phase III, randomized, placebo-controlled, double-blind trial of selumetinib in combination with dacarbazine in patients with metastatic uveal melanoma. Society for Melanoma Research Congress San Francisco, CA, USA. 18–21 November 2015.
. Pharmacology and pharmacodynamics of bevacizumab as monotherapy or in combination with cytotoxic therapy in preclinical studies. Cancer Res 2005;65:671–80.
. BEVATEM: Phase II study of bevacizumab (B) in combination with temozolomide (T) in patients (pts) with first-line metastatic uveal melanoma (MUM): final results. J Clin Oncol 2013;31(Suppl):Abstract 9057.
. Activity of cabozantinib in metastatic uveal melanoma: updated results from a phase II randomized discontinuation trial (RDT). J Clin Oncol 2013;31(Suppl):Abstract 9094.
. A phase III random assignment trial comparing percutaneous hepatic perfusion with melphalan (PHP-mel) to standard of care for patients with hepatic metastases from metastatic ocular or cutaneous melanoma. J Clin Oncol 2010;28(Suppl):Abstract LBA8512.
. Disruption of the MMAC1/PTEN gene by deletion or mutation is a frequent event in malignant melanoma. Cancer Res 1997;57:3660–3.
. Rarity of somatic and germline mutations of the cyclin-dependent kinase 4 inhibitor gene, CDK4I, in melanoma. Cancer Res 1994;54:5269–72. Contributors Defining the concept: RDC. Drafting and critical revision: RDC, GKS, TT, BM, JHF and PDN. Competing interests RDC received non-financial support from AstraZeneca, during the conduct of this work; RDC has received grants, personal fees and non-financial support from AstraZeneca, personal fees from Janssen, personal fees from Thompson Reuters, personal fees from Merck, personal fees from Biogen Idec, personal fees from Aura Biosciences, grants from Melanoma Research Foundation, grants from Melanoma Research Alliance, grants from NIH and grants from ASCO, outside the submitted work. PDN reports personal fees from AstraZeneca, outside the submitted work.